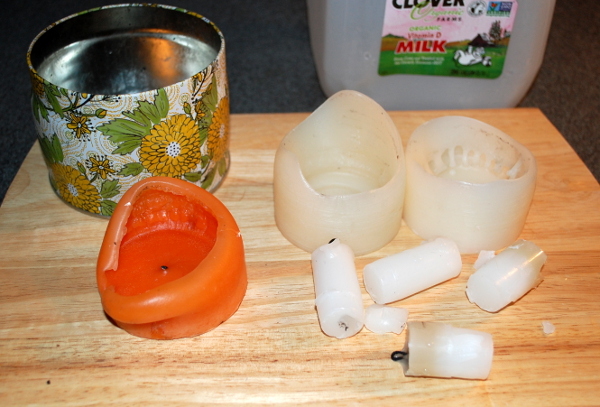 If you’re interested in No-Mess Candle Making, here’s a tip for getting cheap candle wax: check out your thrift store. They are full of half-burnt candles that usually sell for about $.50 or less. These candles are cheap for a reason. Few people want a gummy, sticky, weird-looking candle in their house. But if you’re buying the candles for the wax, it doesn’t matter what the candle looks like since you’ll be melting it down. I’d wager that short of reusing the wax in old candles you already have, this is the cheapest way to get candle wax. Just make sure to smell the candle before you buy. It’s best to stick to no-scent wax in this scenario, unless you want your newly made candle to smell like a thrift store.